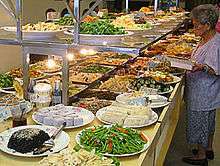 Vegetarian cuisine is known as sùshí (素食) ("vegetarian food"), chúnsù (纯素) ("vegan"), zhāicài (斋菜) ("lent / fasting food") in China, Hong Kong, Malaysia, Singapore and Taiwan; đồ chay in Vietnam; shōjin ryōri (精進料理, devotion cuisine) in Japan; sachal eumsik (사찰음식"temple food") in Korea; jay (เจ) in Thailand and by other names in many countries. 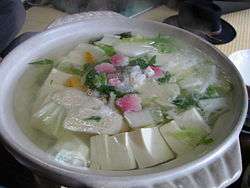 The dishes that comprise Buddhist cuisine in any given place will be influenced by the style of food there. The origin of "Buddhist food" as a distinct sub-style of cuisine is tied to monasteries, where one member of the community would have the duty of being the head cook and supplying meals that paid respect to the strictures of Buddhist precepts. Temples that were open to visitors from the general public might also serve meals to them and a few temples effectively run functioning restaurants on the premises. In Japan, this practice is generally known as shōjin ryōri (精進料理, devotion cuisine), and served at many temples, especially in Kyoto. A more recent version, more Chinese in style, is prepared by the Ōbaku school of zen, and known as fucha ryōri (普茶料理); this is served at the head temple of Manpuku-ji, as well as various subtemples. In modern times, commercial restaurants have also latched on to the style, catering both to practicing and non-practicing lay people. East Asian "Buddhist" cuisine differs from Western vegetarian cuisine in one aspect, that is avoidance of killing plant life. Buddhist vinaya for monks and nuns prohibits harming of plants. Therefore, strictly speaking, root vegetables (such as potatoes, carrots or onion and garlic) are not to be used as this results in the death of the plant. The respective Vinaya forbid the monks and nuns the consumption of mango and garlic. Both prohibitions followed incidents in which monastics harvested more than they could eat in one day. This restriction of not eating garlic and mango is found in both the Theravada vinaya and in that of the Mahayana. The monastic has to follow this rule on all occasions, not just on holidays. In addition to the ban on garlic practically all Mahayana monastics in China, Japan and Vietnam specifically avoid eating strong-smelling plants, traditionally asafoetida, shallot, mountain leek and Allium chinense, which together with garlic are referred to as wǔ hūn (五荤, or 'Five Acrid and Strong-smelling Vegetables') or wǔ xīn (五辛 or 'Five Spices') as they tend to excite senses. This is based on teachings found in the Brahamajala Sutra, the Surangama Sutra and the Lankavatara Sutra (chapter eight). In modern times this rule is often interpreted to include other vegetables of the onion genus, as well as coriander. This food regime follows that of the Taoists who are bent on the life of asceticism. The East-Asian Buddhist rationale is the same as that of the Taoists. This custom also draws parallels with some believers of Hinduism and Jainism who also do not consume pungent tasting foods. Alcohol and other drugs are also avoided by many Buddhists because of their effects on the mind and "mindfulness". It is part of the Five Precepts which dictate that one is not to consume "addictive materials". The definition of "addictive" depends on each individual but most Buddhists consider alcohol, tobacco and drugs other than medicine to be addictive. Although caffeine is now also known to be addictive, caffeinated drinks and especially tea are not included under this restriction; tea in particular is considered to be healthful and beneficial and its mild stimulant effect desirable. There are many legends about tea. Among meditators it is considered to keep the person alert and awake without overexcitement. 1 2 3 "Buddhism and Vegetarianism". About.com. Retrieved June 9, 2012. ↑ "What the Buddha Said About Eating Meat". Urban Dharma. Retrieved June 9, 2012. ↑ Powers, John. "Going forth: Buddhist vision of vinaya - book review <Internet>" (PDF). Retrieved 16 July 2007. 1 2 3 "Buddhism and Vegetarianism". Urban Dharma. Retrieved June 9, 2012. ↑ "The Accidental Vegetarian". Lion's Roar. Retrieved June 9, 2012. ↑ "Why its recommended to avoid Onion and garlic". Absolute-Truth Forums. Retrieved 1 January 2015. ↑ "Tenzo kyokun: Instructions for the Tenzo - White Wind Zen Community". Retrieved 2012-10-15. ↑ Edward Farrey; Nancy O'Hara (16 May 2000). 3 Bowls: Vegetarian Recipes from an American Zen Buddhist Monastery. Houghton Mifflin Harcourt. p. X. ISBN 978-0-395-97707-1. Retrieved 14 October 2012.